James Lippitt Clark (1883 - 1969) was born in Providence, Rhode Island. After his graduation from The Rhode Island School of Design, Clark started working for the Gorham Silver Company as a designer. 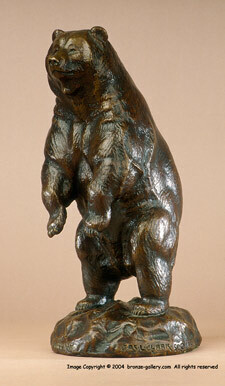 Many of his earliest bronze sculptures were cast by Gorham. In 1902 Clark was offered a job mounting animal specimens for the American Museum of Natural History, a position that he would hold for almost fifty years. He was trained in the art of taxidermy under Carl Akeley in Chicago for his job at the Natural History Museum. Clark made models of his subjects before he undertook to set up a display in the Museum so that he would represent the animal in its natural state and position. Many of these models were later cast in bronze. Every morning before starting work he would go to the Central Park Zoo to sketch animals and on the weekends he would be at the Bronx Zoo sketching. By 1906 he became tired of the limitations of sketching animals in the zoos of New York and traveled to Wyoming where he studied animals in their natural settings. Clark traveled extensively in Europe visiting all of the major Zoos and sketching the animals that he found there. In 1908 he made his first expedition to Africa and it was on this trip that he made the first motion picture of African wild life. This expedition was to be just one of many of his travels around the world in search of animals which included once being captured by Mongols. This intense study of animals through out his life made him one of the finest artists in America, during the 20th century, at showing animals in an accurate natural form. Clark retired from the Museum of Natural History in 1949 and devoted the remainder of his life to travel, writing, and sculpture.